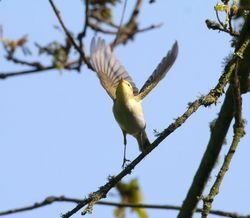 The trilling of a Wood Warbler in one of the south coast valleys on a sunny spring day is a true indicator that spring migration is truly under way. 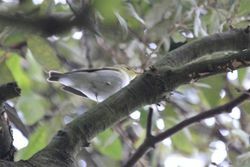 Never recorded breeding in the Bailiwick of Guernsey, Wood Warblers were a scarce breeding species in Jersey. 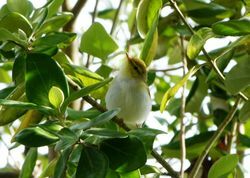 The last recorded breeding attempt was in 1918 and it ceased to breed sometime between that date and 1929 when de Gruchy noted it no longer bred (Dobson). 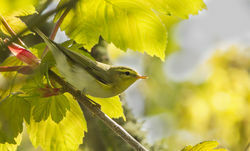 Recorded in Guernsey every year since 1977, the Wood Warbler is a scarce spring and rare autumn migrant that has occurred at most of the wooded areas in the islands. 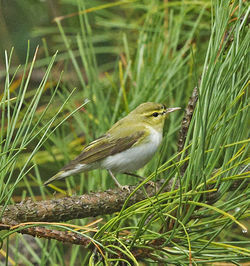 Although Smith did not record Wood Warblers in the Bailiwick, he thought it unlikely that they would breed 'I have never seen the Wood Wren in Guernsey, and, judging from its favourite habitations here in Somerset, I would not think it likely to remain in the Channel Islands through the summer' although he did concede 'an occasional straggler may touch the Islands on migration'. 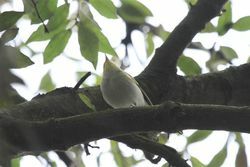 Surprisingly, the first confirmed record in Guernsey was not until 2 August 1959 when two birds were seen at Icart, one remaining until the following day. The first published Bailiwick record is from Burhou on 22 July 1953 (the first record for Alderney in the Transactions is 14-28 April). 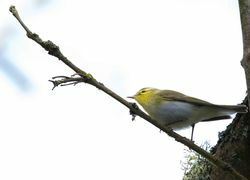 By 1961 it was recorded as a not common migrant in Colin Carey's checklist published in the Transactions. 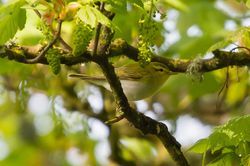 Wood Warblers occasionally occur as early as the second or third week in April but the main passage takes place from the beginning of the fourth week in April to the end of the third week in May, peaking during the first week in May. 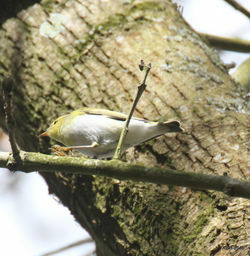 Over the past decade, an average of approximately 5 Wood Warblers have been recorded in Guernsey spring. 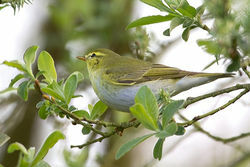 During the 1970s it was an irregular spring migrant but increased in abundance in the 1980s, peaking between 1983 and 1985. These exceptional numbers included one fall in Herm on 29 April 1984 where it was estimated that 20 birds were on the island at the time. 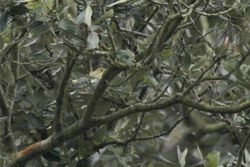 Since that time numbers have remained steady at between 2-9 birds recorded each year and there has been no particular trend in numbers. Philip Guille caught on average approximately 5 birds a year at La Fougeraie. 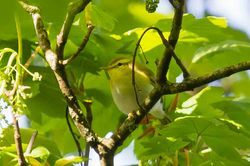 Most birds are recorded in wooded areas and unlike many other migrants, records are scattered around the island although most records come from the Fauxquet and Talbot valleys, Dell Nursery, Petit B�t, the Reservoir, Silbe Nature Reserve, Vaux de Monel and Herm. Most visual records are of singing birds holding temporary territories. These birds can hold these for a week or more and singing birds have been recorded in June twice - one at Petit B�t between 3 May and 1 June 1975 and another bird at Fauxquet Valley between 27 May and 3 June 1984. Any bird occurring after 20 May is noteworthy. 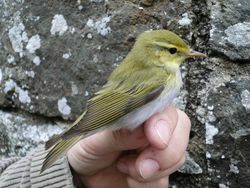 There has been one ringing recovery of the 126 birds ringed up to the end of 1999. Of these 85 were ringed by Philip Guille in Sark and the recovery of a bird ringed by him at La Fougeraie on 15 May 1976 at Fasano, Brindisi, Italy in south-western Italy was unexpected although usual for this Palaearctic migrant that winters in central and eastern Africa.